derPlumps is a 3dan KGS player well known for always wearing a bicycle helmet as part of his"astronaut training" and for only making appointments for the 31st of September. He usually invite lots of people to other people's parties. If you want to contact him, remember: he will repeat everything you say, as a question. Oh, by the way, he likes to pretend being invisible so he might not answer you at all. 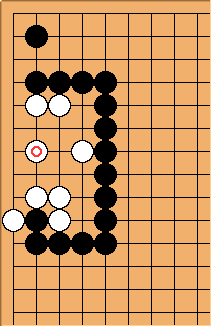 Now, as you read a lot of text you are rewarded a tsumego. Enjoy.